Join the discussion on our forums! Come discuss Bronze Gatekeeper over in our dedicated Bronze Gatekeeper discussion topic. "You have my shield! And the rest of me too." Top tier magnetic minion. Probably will see play in many mech decks and maybe other types of deck as well. So I think the time is about right to make a list of Silverback Patriarch power creeps starting from Naxxramas. So as we can see, Journey to Un'Goro is the most brutal towards Silverback Patriarch, with 3 Patriarch powercreeps, 1/3 was seen in many decks at one point and 2/3 still seen in many decks today. Just counting things that have better stats/cost or have additional card text. you've forgotten Twilight Geomancer and Druid of the Swarm. But I wouldn't count Hired Gun Lil' Exorcist or since they don't have 4 health, or Deathlord since it has a drawback. 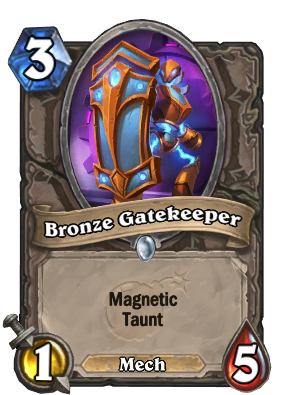 Considering all the health mechs have and if Mech decks become really good this expansion, this card will most likely see play. I wonder will this be popular enough to make The Black Knight staple again.